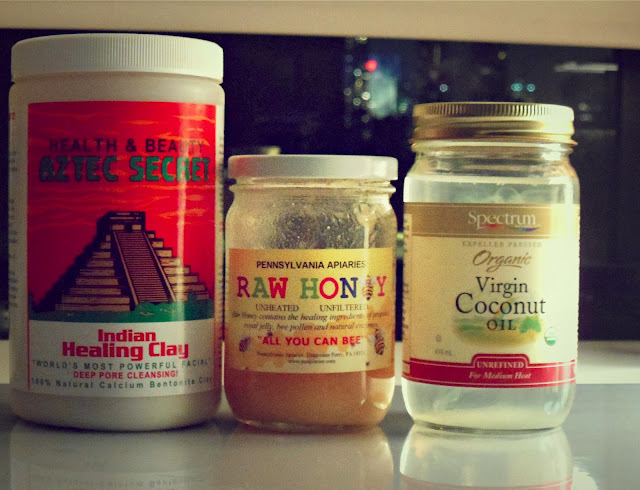 I've been getting into the habit of giving myself a facial and treating my hair with a homemade hair mask every week. I love using all natural ingredients as I think they work the best, and are guilt-free (no chemicals, preservatives etc)! I do also use some regular products, but have been taking the natural route, when doing facials, for the past few months. I combine honey, coconut oil, olive oil and ground cinnamon. Mix it up into a paste and apply it to my hair and wrap a plastic bag around my head. I leave it in for about an hour, and sometimes I sleep with it in my hair for an extra hydration boost. This sounds great, I have to try this facial:) Where can I find the Indian Healing clay?? Thanks so much! Annie - I tried your hair mask but I must have done something wrong in the portions. It was super sticky and hard to get in my hair evenly. I only got some on the ends and ran out. It seemed to just stick to the outside parts of my hair? I put a heaping tbs of all ingredients (except the cinnamon which I just sprinkled). Can you PLEASE give more details on your hair mask recipe? Thanks! I just ordered me some Indian Healing Clay on ebay. Can't wait to try it!